It's hard to imagine today when war remains a far off concept aired on CNN in dusty and dry places. It's hard to imagine the feeling on August 5, 1914 when Lord Liverpool announced how war had broken out with Germany. While the wars of the 19th Century had been bloody, few people could have realized what was in store for them. In fact many expected a swift victory. Yet by 1914 mechanism had marched faster than the hooves of cavalry forces to the point when it could tear armies apart with impunity. The new dynamic became obvious as the Germans marched into France. Germany was acting on a plan drawn up in 1905 called the Schlieffan Plan in which General Count Alfred Von Schliffen had concluded Germany could not fight a war on two fronts and to be decisive it should deal a decisive blow to France in the west. Germany invaded west through Belgium setting the scene for the First Battle of the Marne from September 6 - 12, 1914 in which the Germans were repulsed from capturing Paris. Less than a month into the war it was apparent how flesh was no match for shells and the French lost 250,000 men at the Marne, the Germans a similar number and the British more than 12,000. As it became apparent that the Germans would not easily knock out French, both sides stated to dig trenches and the four years of mud and blood and abject terror that characterized trench warfare ensured. Now and again the combatants would try to break the deadlock with costly offensives. During the Somme offensive from July to November, 1916, Britain lost more than 350,000 men, France more than 204,000 and Germany more than 465,000 men. The figures fail to convey the full horror of the battlefield, of men cut to pieces on wire, or lacerated by guns, suffering agonizing deaths in shell holes in no mans-land. Few battles in history have so aptly summed up the futility of war. The Somme secured the Allies a few hundred yards of blood drenched soil. While we associate World War One with the trenches of the western front, there was an equally bloody war going on between Russian on one side and Germany and Austria Hungary on the other in the east. Indeed the Russians suffered higher casualties than any other army, serving as a catalyst for the Russian Revolution. In the south the Italians were fighting the Austrians in the mountains and there was a bloody war in the Balkans while the bloody and abortive attempts of the allies to attack Turkey at Gallipoli, was one of the most tragic episodes of a war steeped in tragedy. It's hard to imagine such horror in retrospect and a war that was fought for no real purpose. Once while driving through France, I came across the River Somme and a dark curiosity came over me. Then I remembered Uncle Charlie who rocked in his chair and talked about nonsense, never once recalling his days as a stretcher bearer at the Somme. It was true for much of the country that those who came home seldom recalled the horror that was the Great War. Some were driven mad by the sound of shells and disappeared into homes to die in obscurity 70 years later. Yet I was filled with a curiosity to see the plain white crosses spreading across these bare hills and the massive memorial that rises from the bones of the ground at Thiepval to those missing who never came home from the Somme, hideous and heavy with the weight of the names on its sides. We should never forget the War to End All Wars, which held the seeds of another war every bit as horrible 25 years later, but I have seen little publicity about the anniversary of the First World War, given its significance. 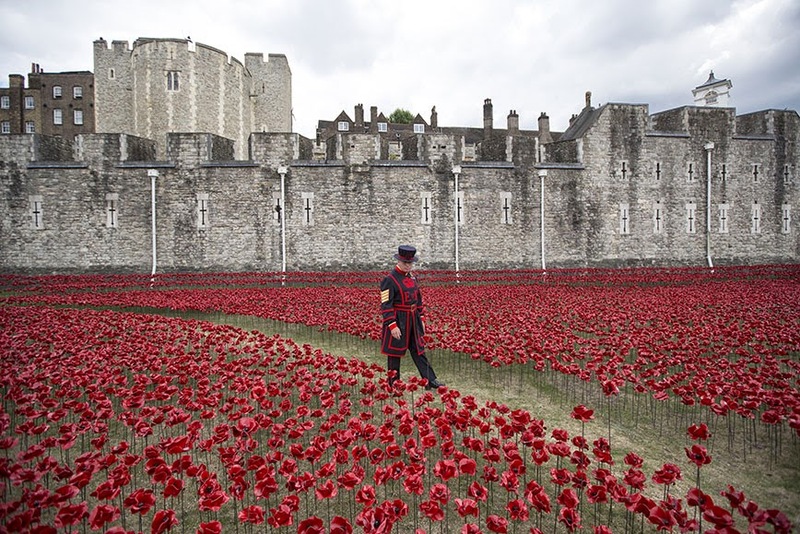 However, in London a beautiful exhibition at the Tower of London called Blood Swept Lands and Seas of Red by Paul Cummins is a poignant reminder of what was lost. 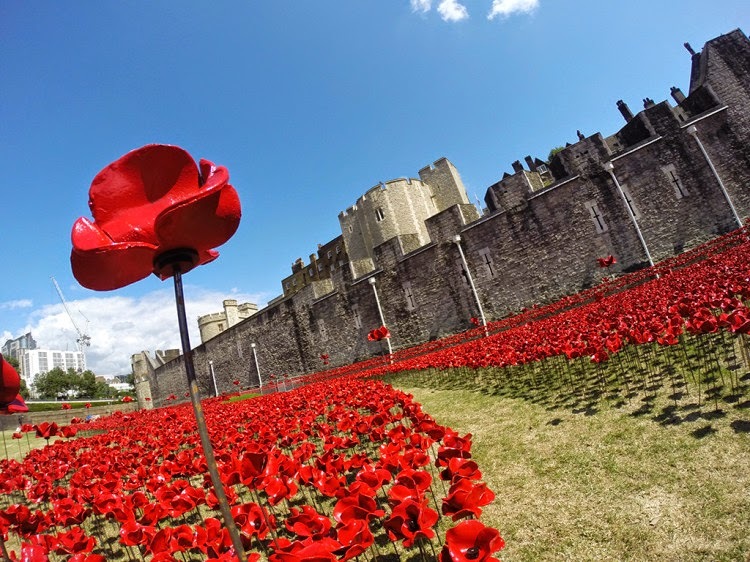 It will be officially unveiled on the anniversary of the declaration of war on August 5 and features 888,246 ceramic poppies planted in the moat of the tower, each one representing a British military fatality in World War One. I'm off to the UK this weekend and will be in London on Monday so I will go and visit this. It looks spectacular, and incredibly tragic. Thank you for this post. Lest we forget. I think it's wonderful that such an exhibition was organised and I wish more countries would make the effort to commemorate WWI - given, as you say, its tragic significance to mankind. Thanks again. What a beautiful exhibition. 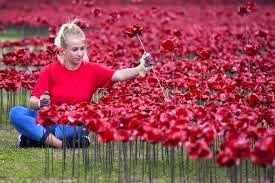 It's very sad that there have to be that many poppies. Well, as you know I went to visit this display last week and it was decidedly moving. If you do come back over, it's definitely worth a visit. Did you know that that you can make cash by locking selected areas of your blog / website? Simply open an account with AdscendMedia and run their content locking tool.